On April 15, I ran my ninth Boston Marathon. This is my favorite marathon, and I’ll keep running it as long as I can qualify. Each year, it gets harder to qualify. It also gets harder to find a close hotel. Most of the hotels within a mile of the finish line are fully booked almost a year in advance. In the last seven years, I’ve stayed at six different hotels. This year, I stayed at the Hilton Boston Back Bay. This hotel is about a mile from the finish line, but it’s right around the block from the Hynes Convention Center, where the expo was held. I flew to Boston on Saturday, arriving in the early afternoon. My Boston weekend is usually filled with meet-ups with various running clubs. This year was no exception. After checking in at the Hilton, I immediately went to the Beantown Pub, to join a happy hour gathering of Boston Squeakers. Several of us stayed there for dinner, while watching golf on TV. I don’t remember the Masters being the same weekend as the Boston Marathon in other years. I got to bed early and slept well until 4:30. Then I woke up and couldn’t get back to sleep. When I finally got up, I felt tired, but I wasn’t too worried. What mattered more was how I felt on Monday. I went to the expo right when it opened. I was able to pick up my race packet, drop it off at the hotel, and still make it to Thornton’s in time to join one of the other Boston Squeakers for breakfast. I was feeling run down, but getting some food in my stomach helped. After lunch, I stopped by the Hilton again to organize my clothes for the race. While I was there, I watched the leaders finishing the last few holes at the Masters. Later, I went to Sola Irish Pub for a happy hour gathering of the 50sub4 Marathon Club. Every Boston Marathon experience is different, but there were a few things I could always count on being the same. I always used to have lunch or dinner at Durgin Park. It was one of the oldest restaurants in the United States, and it was my favorite restaurant in Boston. Sadly, they closed their doors in January. This was the first time I stayed in Boston without dining there. Instead, I had dinner at California Pizza Kitchen. There are better pizzerias in the North End, but I was tired and wanted to stay close to the Hilton. I got to bed early again, but woke up even earlier than the night before. After 2:30, I couldn’t get back to sleep. To paraphrase Forrest Gump, Boston weather is like a box of chocolates. You never know what you’re gonna get. Last year, we had almost two inches of rain, with cold temperature and 30 MPH headwinds. In 2012, it was a sunny day with temperatures topping out at 88 degrees. Having seen both of those extremes, I knew I had to be prepared for anything. This year’s weather kept everyone guessing. A week before the race, the advance forecast was showing a storm system that could bring conditions just like last year. By the weekend, it became apparent that the low pressure system bringing rain and strong winds would arrive earlier than expected. There was a brief thunderstorm during the night, but it looked like the rain would stop before the race started. As the front moved through, it brought warmer temperatures. It was 50 degrees when I left the hotel, and it was forecast to get into the upper 60s in the afternoon. It was unclear if we would get more rain before the race finished. The only thing that seemed certain was that it was going to be cloudy all day. On race morning, most runners get to the start at Hopkinton by taking a bus from Boston Common. You get up early and wait in a long line to board a school bus. The bus ride takes about an hour. Then you get dropped off at the Athletes’ Village on the grounds of Hopkinton High School, where you wait until it’s time to walk to the start corrals. I always considered that to be a big part of the Boston Marathon experience. I used to enjoy it, but it’s changed over the years. I have fond memories of 2012 and 2013, when I was waiting in the village with a group of friends. We were all in the first wave, so we arrived before the village got too crowded, and it was easy to find each other. Back then, they had a gear check in the village, so you could wear your favorite warm-up clothes, leave them at the gear bag drop, and then pick them up in the finish area. In 2014, things started to change. Security was tighter after the bombs in 2013, so you if you wanted to check a gear bag, you had to do it in Boston Common before boarding the bus. Any extra layers you wore in Hopkinton had to be donated or thrown away. I’m not as fast as I used to be, so I was no longer assigned to the first wave. As my corral assignments changed to the second wave and then the third wave, I discovered that the village gets much more crowded the later you arrive. It’s much harder to find people you know, so I sometimes had to wait by myself. The bathroom lines also get longer. The first time I was in wave three, I spent the entire time waiting in line, and I barely got through the line before it was time to leave the village. Last year was the worst experience. I arrived early enough to find space under one of the large tents, but when I needed to get in line for one of the port-o-potties, I had to stand outside in heavy rain and driving winds. Leaving the village, there was no way to avoid walking through mud and deep puddles. This year, I decided to do something different. One of my running clubs, Marathon Maniacs, chartered a bus from Boston to Hopkinton. To get a spot on the bus cost $90, but instead of riding in school buses, we had a nice comfortable motor coach with a bathroom. Instead of getting dropped off at the high school, we had a private area in Hopkinton with dozens of port-o-potties. We also had the option of staying on the bus until it was time to head to the start corrals. The motor coach left from the Boston Park Plaza hotel. They started loading the bus at 7:10 and left at 7:30. Had I taken one of the school buses, I wouldn’t need to be on a bus until after 8:00. Even though it meant leaving earlier, the convenience was worth it. The Park Plaza is about a mile from the Hilton, but I could minimize time in the rain by taking the subway most of the way. I wasn’t planning to leave until 6:45, but at 6:15, my weather app said a thunderstorm was going to start in 15 minutes. I quickly finished getting ready and walked to the nearest subway station while there was a break in the rain. When I got to Arlington Station, it was sprinkling, but I was able to walk to the Park Plaza before the heavy rain started. A few minutes later, it was a downpour. I didn’t have anything to eat before leaving the Hilton, so I stopped at a Starbucks inside the Park Plaza and bought some coconut snacks to serve as a light breakfast. When the bus arrived, it wasn’t able to pull up to the curb. We had to walk to the other end of the block and then walk out to the middle of the street to board. By now, it wasn’t raining as hard, but I had to hurdle a wide puddle to get to the bus. The race didn’t start for a few hours, so I wanted to keep my shoes dry for as long as I could. We got to Hopkinton just after 8:30. All the charter buses parked at an elementary school. From there, we would eventually have a five minute walk to get to the Athletes’ Village at the high school. In the meantime, we could stay on the bus. The elite athletes had early start times. The rest of the field was divided into four waves of roughly 7,500 runners. Wave one started at 10:02, wave two started at 10:25, and wave three started at 10:50. Wave four was originally schedule to start at 11:15, but because of concerns about afternoon rain, they started immediately after wave three. Based on my qualifying time, I was assigned to the third wave. I left the elementary school at 10:00. To get to the start corrals, I first had to walk through the Athletes’ Village. Runners from the 4th wave were still arriving, so it took time to make it through the crowds to get to the exit. Then I had the familiar walk down Grove Street to get to the corrals. When I got there, it was still too early to enter the corrals. There are port-o-potties in the nearby CVS parking lot, so I made a final bathroom stop before making my way to my corral. Each wave is divided into eight start corrals. I was in the first corral of my wave. If I wanted, I could line up at the front and race through the first mile with nobody in front of me. That would be exciting, but it wouldn’t be very smart. The first 15 miles have a downhill trend, and it’s most noticeable in the first few miles. Racing through the downhill miles is a way to set yourself up for some slow and painful miles near the end of the race. Instead of lining up in front, I stayed at the back of my corral. That way, there were enough runners in front of me to keep me from going too crazy in the first mile. Because it was in the 60s, I wore shorts and a singlet. As warm-up layers, I wore a Tyvek jacket and a pair of wind pants. I put the wind pants in the donation pile when I left to walk to the start corrals. I tied the Tyvek jacket around my waist before starting the race. 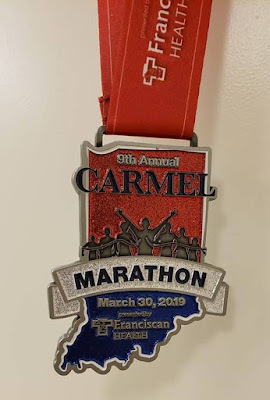 Four weeks ago, I finally qualified for next year’s race. Although I’m qualified, I’m not sure if my qualifying time will be fast enough to get me into the race. Ideally, I wanted to go for a faster time in this race, but I didn’t know if I was up to it. I wasn’t feeling 100 percent. If it rained, the extra weight of wet shoes and clothes could slow me down. If it didn’t rain, I could get too hot to sustain an ambitious pace. My plan was to start the race on pace for a time between 3:30 and 3:35. Then I’d wait and see how I felt. Because I was planning to at least take a shot at a fast time, I left my camera and phone at the hotel. I didn’t want to make stops, and I didn’t want to carry any extra weight. I also didn’t want my phone to get wet if heavy rain started again. My qualifying time for this race was 3:28:13. Everyone in my corral had a similar qualifying time. In theory, the people around me would all be going close to the pace that I wanted to start, so I could just hang with them. In practice, everybody gets excited and starts too fast. The downhill start makes that even more likely. Starting at the back of my corral worked well. I ran the first mile in 8:14. That was actually a little bit slower than I intended, but I picked up the pace over the next few miles. I averaged 8:01 through the first five miles. That put me on pace for a finish time of roughly 3:30. The course goes through seven other communities besides Boston. After about a mile, we left Hopkinton and entered a remote part of Brookline. A spectator yelled, “Brookline: Almost there!” What made this funny is that we actually go through Brookline twice. It’s the first city after Hopkinton, but also the last city before the finish in Boston. Later in the race, one could say this in all honesty, as you’re in Brookline when you enter the last mile of the race. In the absence of rain, the air felt warm and sticky. By the end of the second mile, I was already getting sweaty. After two miles, we entered Ashland. All the spectators in Ashland are local residents. Families in Ashland come out to watch the race every year. Aid stations are fairly frequent in this race. The first one is at two miles. After that, they’re every mile. I didn’t feel thirsty yet, but I started drinking Gatorade at every aid station, knowing I was going to be sweating heavily. After five miles, I abandoned the idea of trying to pace for 3:30. The pace already felt tiring, even though I had been mostly running downhill. I backed off a little. Now I was entering Framingham. There’s a commuter rail station here, so in addition to local residents, we also got support from people who took the train from Boston. This is the first place where friends and family staying in Boston can get an early glimpse of the runners they’re supporting. Running through Framingham, I was averaging roughly 8:10 per mile. Then I reached Natick. Here the course levels off briefly. The terrain is slightly rolling, and I still felt like my pace was too tiring. I slowed to 8:15 in the 6th and 7th miles, and then slowed to 8:25 in the 8th mile. Around nine miles, we ran past a lake. I felt a cool breeze near the lake. That was the first time I noticed any wind. As we got past the lake, I went back to feeling hot. I had to skip the next aid station. I knew I needed fluids, but I felt like I was filled to the gills with Gatorade. After skipping one, I was able to resume drinking at all the others. At 10 miles, I entered Wellesley. Now it was starting to get sunny. That was the last thing anyone expected. Running through Wellesley, my pace finally stabilized. For the next five miles, I averaged roughly 8:15. By now I knew I wouldn’t run a qualifying time for next year, but I was going to do the best I could. At 20K, I reached Wellesley College. It’s a women’s college right along the marathon route, and for decades, the students have come out to cheer the runners. They hold up signs and cheer as only college students can. They call it the Wellesley Scream Tunnel. For the next several minutes, I’m distracted from my fatigue. As I got past the Wellesley Scream Tunnel, I was almost to the halfway point. I got there in 1:42:17. I was still on pace to break 3:35, but that’s misleading. I had slowed down since the early miles and I expected to slow down more in the second half. Since the beginning of the race, I felt like I was running too fast. The second half is more difficult, and now it was a bright sunny day. The heat was becoming a factor. I fully expected to slow substantially in the second half. I realized at this point I could phone it in and still break four hours. I only needed to average 10 minutes per mile in the second half. I pressed on at the same pace. This is Boston. I wasn’t going to phone it in. The next major landmark was the Charles River, which comes just before 16 miles. From the 15 mile mark to the river, it’s sharply downhill. As I neared the river, I felt some of the Gatorade coming back up my esophagus. I was able swallow it down again. I don’t know why I felt so full. Maybe my fanny pack was too tight around my waist. As I crossed the river, I entered Newton. Then the character of the race changed. Up until now, the course had a gentle downhill trend. Through Newton, the trend is slightly uphill. There are four noticeably hills in Newton. None of them are particularly large, but this is where it can be difficult to sustain the same pace. I noticed some tension in my left Achilles tendon. That was from all the downhill running. Fortunately, it didn’t bother me once I started running uphill. The first hill in Newton is gradual, but it’s about three quarters of a mile long. Usually, I pick up my effort here in hopes of maintaining my pace. This year, I was more concerned about overheating. All the way through Newton, I tried to find a pace that wouldn’t make me overheat. After crossing a bridge over the freeway, I noticed more crowd noise. There’s a T station nearby, so this is a spot that’s easy to reach for spectators traveling from Boston by subway. After finishing the first hill, I reached the 17 mile mark. That mile took 8:35. It was my slowest mile so far, but it was still faster than I expected. I recovered from the hill on a gradual downhill section. After half a mile, I made the right turn at the Newton Fire Station. This was the beginning of the second hill. The second hill, known locally as Braeburn Hill, is steeper, but not as long. I maintained a consistent effort and didn’t worry about slowing down. I was pleasantly surprised to feel a nice cool cross breeze. Then I realized why I wasn’t noticing any wind before. For most of the race, it was at our backs, where it doesn’t provide much cooling effect. Going up this hill, the breeze helped, but the road eventually bends to the left, and I stopped feeling the breeze. After the second hill, there’s another nice downhill section, where I was able to recover again. Now I started watching for the clocks. There are a few friends I can count on seeing in Newton every year, because they always volunteer here. At 18 miles, I looked at my watch, but I couldn’t remember my previous split. I’m not sure what my time was for that mile, but it doesn’t matter too much. On this section of the course, I was more focused on how I felt. I didn’t want to work too hard and overheat. At 30K, I saw my friend David. I moved to the side of the road, so I could give him a double high five. A few minutes later, next to the 19 mile clock, I saw Alison and Elizabeth. I gave them each a high five. I forgot to read my watch. The third hill is less memorable. The start of the hill doesn’t coincide with any landmarks that I can remember. It’s also tough to know when you’re done with it. There isn’t a well-defined crest. It just seems to level off. At 20 miles, I finally checked my time. I was pleased with my pace through the first three hills. I could break 3:45 just by running 10 minute miles the rest of the way. I couldn’t stomach any more Gatorade. For the rest of the race, I drank water instead. I needed fluids, but at this point drinking more sugar wouldn’t help. The fourth hill in Newton is the famous Heartbreak Hill. It would probably surprise most people to know that it’s only a 90 foot rise. It only seems bigger because of where it is on the course. As I started up the hill, I was handling it well, but halfway up the hill, I could feel myself slowing down. For the first time in the race, I saw several people walking. I continued running, but my legs got really heavy by the time I reached the top. After cresting the hill, it took a few minutes for my legs to recover. Then I saw Boston College ahead of me. At 21 miles, I checked my watch again. That mile took 9:10, but now I was beginning a nice downhill stretch. Running downhill, I felt my Achilles tendon again. That forced me to hold back a little. The crowds near Boston College were loud – maybe even louder than Wellesley. Just past 22 miles, I entered Boston for the first time. Then I made the left turn at Cleveland Circle and entered Brookline again. By the time I reached 23 miles, I realized I would easily break 3:43. Despite my difficulties, this was going to be my second fastest race of the year. I just needed to maintain my effort. Midway through the next mile, I got my first view of the large Citgo sign near Fenway Park. It was still a mile and a half away, but I was running directly toward it. When I got there, I would have one mile to go. There’s a tough little uphill stretch just before 40K. I was struggling now, but that’s how it always is. I reached 40K and looked for the 25 mile sign. Then it was just a short distance to the Citgo sign and the one mile to go sign painted on the street. I realized I would break 3:41, but 3:40 still seemed out of reach. With one kilometer to go, I took the ramp onto Commonwealth Avenue. It’s downhill going under a bridge, but uphill on the other side. That little rise took a lot out of me, but now I was in Boston again. After one more block, I made the right turn onto Hereford. It was slightly uphill for three short blocks, but I fought to pick up my pace. As I made the final turn onto Boylston, I wanted to put on a finishing kick, but I didn’t feel like I had any gas left in the tank. Then I saw my time at the 26 mile mark and realized I was going to break 3:40. That spurred me on to give it all I had. When I was still about a minute from the finish line, I got short of breath. I couldn’t sustain the pace, but I did what I could. I crossed the finish line in 3:39:20. That’s not a Boston qualifying time, but it’s my second best time this year by a wide margin. I ran positive splits by five minutes, but I was expecting to be much slower. The finish area stretches all the way to Boston Common. In the first block, it’s mostly medical personnel, looking for runners in distress. I kept walking forward at the best pace I could manage. Near the end of the block, I saw someone I recognized. It was Yuki Kawauchi, last year’s winner. I went over to shake his hand. I really regretted not having my phone with me. I missed an opportunity to get a photo with Yuki. In the next block, I got a bottle of water, my finisher medal, and a heat shield. It was breezy in the finish area, and at first the heat shield seemed like a good idea. Within minutes, however, it was making me sweat. 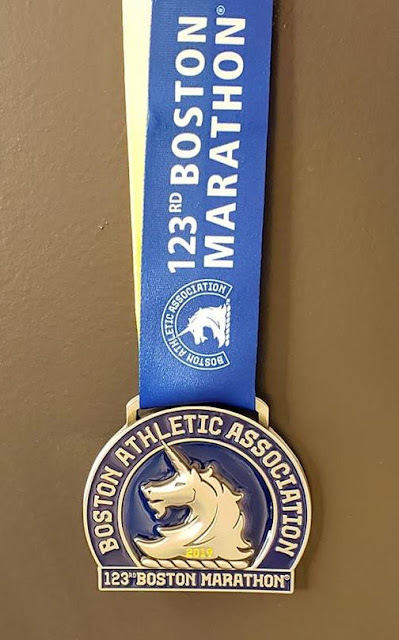 The finisher medal always features the logo of the Boston Athletic Association, which has sponsored this race since 1897. There are larger medals and fancier medals, but this one is still my favorite. The next block had post-race food. I started eating a protein bar and washing it down with water. Chewing made me get short of breath again. I carried the rest of the post-race food with me as I continued walking. After one more block, I reached Arlington Station. By now, my quads were already getting stiff. I had to use the hand rail as I walked down the steps into the subway station. There were so many people in the station that it took time to get through the turnstiles. When a train came, it was standing room only, but some of the people sitting got up to let runners sit down. I was grateful. I don’t think my legs could have kept me stable as the train started and stopped. Moments after sitting down, my feet cramped up. Yup, I was dehydrated. When I left the station near my hotel, it was raining. I was hot, so the rain felt good, but the wind was picking up, and it seemed like the temperature had dropped 15 degrees. Would runners still on the course get cold now? After getting back to the Hilton, I took a hot bath to loosen up my legs. When I tried to dry off, I got so short of breath I had to sit down. I had to rest for a few minutes before I could finish drying off and get dressed. I finished the race feeling like I was under control, but I almost pushed it too far. I still had a bottle of water and a protein drink from my race packet. I drank them both. Then I felt better. I ate one of the rolls from my post-race food bag, but didn’t have room to eat anything else. I saved the rest for breakfast. A few hours later, my appetite returned and I went out for dinner. I think it was good to get out and do some walking. By Tuesday morning, the soreness in my legs had improved, but I was still working on getting rehydrated. I’ll keep working on getting a better qualifying time. I want to be back next year. I don’t know what the weather will be. It could be anything.